Spring is a great time to clean up the house, but it’s also a perfect time to take on new remodeling or decorating projects. We’ve got a list of trends and ideas for 2016 that will ensure your bathroom is not only functional, but incredibly stylish. 1. Creative tile patterns. 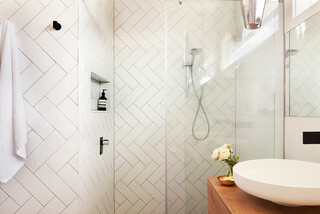 Geometric patterns may be reigning in tile formations for the kitchen, but designers are seeing homeowners shifting back to more classic patterns for the bathroom. Basic tiles with a twist seem to be the trend this year with usual shapes being laid in unique patterns. Basketweave, windmill, or herringbone designs can accomplish both modern appeal as well as visual drama. This is also a great avenue for color-lovers to explore if neutral palettes aren’t exciting enough. 2. Spatial planning is key. Modern design often encourages seamless lines and space without clutter. As such, this next trend seeks to eliminate the need for unwelcome disorder. Designers are seeing an exponential increase in storage capable of hiding items like hair dryers, lotions, and other such items that might have otherwise been careless left strewn about bathroom surfaces. Unless it serves a consistent purpose, it is best tucked away allowing for more repose in the room. 3. Leafy additions. A trend popular in 2015 that is continuing to expand in 2016 is that which calls for the addition of indoor plants to bathrooms. What was once considered an ornamental piece is now an integral part of the room’s design and can easily be switched up per the season’s dictation. The plants placed in the room can help set a tone that might have otherwise been reliant on textiles or other decorative elements. 4. Metallics all around. The kitchen isn’t the only place where you’ll be able to find an increase in metallics this year; recent trends indicate that this year there will be a continuation of the use of metallics in the bathroom. Not only do metals introduce opulence into the space, but they can greatly compliment natural pieces and encourage glamourous character. Look for matte or satin finishes for maximum style; brushed stainless steel and brass are at the forefront of this trend. Not into having a copper tub? Add some pizazz with smaller touches in the room such as towel bars, shower rails, or accessories. 5. Cool equals calm. The bathroom is no longer a purely functional room; it also offers tranquility that may otherwise not be found in other parts of the home. As such, bathroom trends indicate that cool hues like blues and emerald greens will be the top picks for 2016. To really bump up the style factor, try pairing these colors with crisp white, natural wood, or even metallic accents for sophistication and edgy flair. 6. Nature isn’t limited to wood. In this year’s bathroom trends, earthy materials such as natural stone and river rock are making their way inside. What was once reserved for floors or walls is now being used for vanity tops, sinks, baths, and even bathroom furniture. 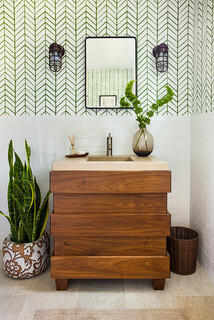 Much like a spa, the bathroom now calls to nature for visual and tactile texture. Try opting for a kiln fired ceramic or polished stone sink instead of the standard porcelain. 7. Ambience increases. Furthering the mindset that the bathroom is a place of escape and sanctuary, focus will be shifted to increasing the bathroom’s ambience. Custom cabinetry, mood lighting, and feature faucets will serve as the base for integrating key functional elements. Home decor and small furniture will be making their way in; stools, armchairs, coat racks, rug style bath mats, and pendant lights are just a few examples of these homey touches. 8. Think pink. 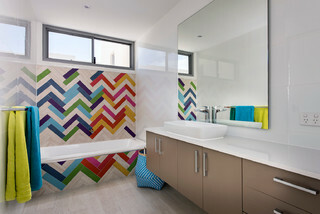 We’re certainly not suggesting the paint the entire bathroom neon, but touches of bright colors are in this year! From dusty pink to peach or coral, experiment with introducing bursts of pink to the space. Choose either an accent wall, accessories, or even towels to bring the brightness in harmoniously. If you’re not into pink, purple and black can be a great alternative that offers the same drama pink brings as well as tasteful opulence. 9. Wood is here to stay. A time honored classic, wood has been present in homes since the beginning of time. From simple to complex, wood is a versatile material able to cross many borders and be used in a multitude of ways. If you’re looking to incorporate wood into your bathroom, explore using it in unexpected ways, such as on the wall or as a sink. These additions can add a level of naturistic warmth that otherwise may have been difficult to achieve. 10. For the love of handmade! Artistry is having it’s time in the spotlight this year as handmade tiles are very much trending for 2016. Hand crafted tiles, considered beautiful and special because of their imperfections, helps a bathroom exude visual appeal and textural variety. A great complimentary item in the same space could be stone as the varying textures will go quite well together. Are your prepping for a renovation this year? We’d love to talk with you about it - give us a call today! Saroca, Natasha. (January 1, 2016). 15 Bathroom Trends Splashing Down in 2016. Retrieved from http://goo.gl/jd3QS8.